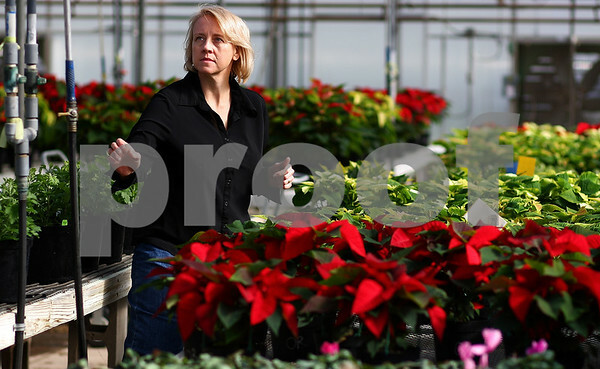 Kim Mauthe reaches for a watering hose next to her poinsettias in a greenhouse at Kishwaukee College during her fall crops class on Tuesday, Nov. 1, 2011. Mauthe chose to go back to school in fall of 2007, eight years after she received her bachelor's degree, because she wanted to pursue a job that was more satisfying. She is set to graduate in May 2012 with associate's degrees in nursery, greenhouse and landscape design.